Obama Talks About Deficit, Debt Reduction : The Two-Way President Obama delivered a much-anticipated address on his proposals for cutting the federal government's annual budget deficits and reducing the enormous, $14 trillion federal debt. Read through what he had to say. 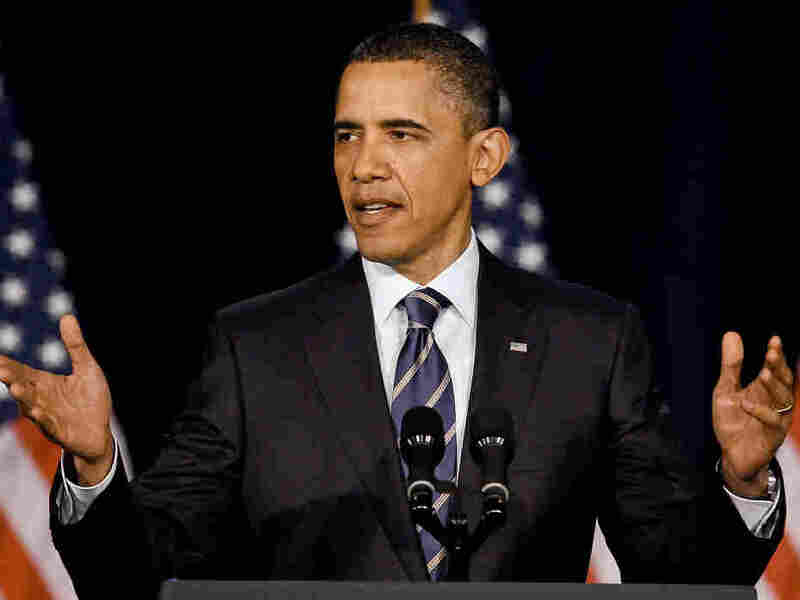 President Barack Obama speaks about fiscal policy at George Washington University on April 12, 2011 in Washington, DC. Update at 3:10 p.m. ET: Saying that lawmakers need to come together in a bipartisan manner as they did in the 1980s and 1990s to tackle the exploding federal deficits and debt, President Obama offered his proposals today for how to get the government's books in order. He said his plan would cut $4 trillion from deficits over 12 years, and that it includes trims in spending on defense and health care, as well as the end of the so-called Bush-era tax cuts for wealthier Americans. You can see what he had to say, as well as some thoughts from other Two-Way readers, in the box below. We also have the audio of his address in the player above.